So, how it works. you ask? Welcome to NationalCPRFoundation! Here at NCPRF, we focus on life-skill techniques with our development of life-training curricular modules. 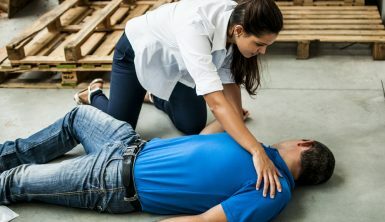 Read below to find out what we offer and review the simple steps to completing your online CPR certification in minutes. But first, Do you need CPR certification? Other courses can be lengthy, time-consuming, redundant, and just plain boring, so at NCPRF we endeavor to include only the most up-to-date and essential information. 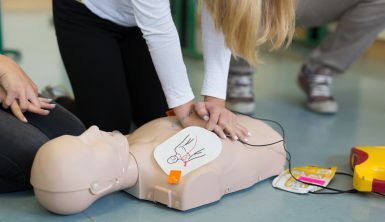 Each course takes approximately 15 to 25 minutes to complete, with the exception of our BLS course which typically takes users around 30 minutes from start to finish. It’s never been easier to get the essential information and credentials you need, no matter the industry, field, or reason for seeking a life-training skills class. Among our extensive library of online high-quality courses, there is a course to meet the needs of any professional requiring either first-time certification or renewal. All of our courses are compliant with American Heart Association (AHA) and the Emergency Cardiovascular Care (ECC) guidelines and are accepted by employers across the globe. NCPRF is able to accommodate the entire certification process online, so there is never a need for anyone obtaining certification to meet an instructor in person. The life training courses provided are accompanied by images and clips demonstrating proper application of rescue services to provide a deeper level of understanding of these procedures. By ensuring all content in our courses is relevant and presented in an easy-to-digest format, our lessons are not only quicker and easier to navigate but also more engaging and enjoyable as our users understand they are only receiving the information pertaining to the courses they need. Instead of hiding the content of our courses, the entire course content is available immediately to everyone who accesses our website. The lessons are available along with course summaries, downloadable study materials, and practice exams that are compatible with any mobile device. We endeavor to make this information accessible to all, and to that end, there are never any charges for our educational content. To prepare for a course, professionals may view our breakdown of the lessons including a summary of content covered in each lesson. Users will also find a study guide including a downloadable PDF format, available on any computer with access to the internet including mobile devices such as tablets and smartphones on our study guide page. After reviewing the material, users can access our multiple choice tests. With only 10 questions on each exam, they only take moments to complete so professionals can get back to the life-saving work they’ve dedicated their lives to. The exams are free-of-charge and available to anyone with access to our site. Tests results are available immediately and there’s never any need to worry about failing the tests, as they are available to retake as many times as you wish. These tests are never timed and all users may navigate through the training material, and tests, at their own pace. This ensures each person has ample time to repeat their lessons for optimum understanding and retention. After the test is completed, users will purchase their proof of certification and receive their certificate, along with a printable wallet card, immediately via email. We will follow-up by mailing a free PVC/vinyl wallet card within two to five business days. Once certification is received, the process is complete, so professionals can provide proof of insurance to employers immediately and get back to their lives. For employers seeking quick and easy Group Discount certification, we are happy to provide a 20% group discount with instant access, once the purchase is complete. To register for group discounts, users will set up a simple admin account. This account allows easy management of the group’s members, purchase of additional courses, save payment information and access to download employee’s certifications and cards online, all from an easy-to-use admin dashboard. Whether professionals are attaining certification independently, or with a group, our 24-hour customer service is always available via email to ensure users enjoy their certification process seamlessly. Our customer service professionals are able to assist with any follow-up questions concerning content, online navigation or any technical difficulties that may arise. It is our goal to provide this essential life-saving information in a painless and streamlined manner with quality and integrity. All of NationalCPRFoundation’s certifications are fully accredited and will be accepted nationally, as well as internationally. However, if a complication should arise and a professional finds that their learning institution, employer or licensing agency denies their certificate, we will provide a 100% refund when reported within 30 days of certification. It’s as easy as that! All of our courses are fully accredited, but if a refund is required we will handle this experience with the same prompt professionalism users have come to expect from NCPRF. How long does CPR certification last? Additionally, all of our certifications are valid for the duration of two years, so users can save even more time by returning for recertification only once every 24 months as opposed to other 12-month certificates. 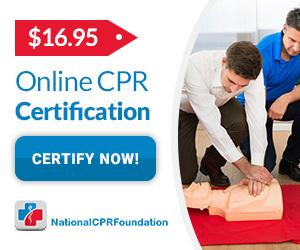 With easy access to fully accredited online CPR certifications and the full support of our 24/7 staff, now certification is accessible to thousands worldwide. Just ask the 791,779 professionals we have already had the pleasure of serving! Whether professionals are striving to secure a new position, stand out in a crowd of applicants, or simply renew their certification for their ongoing employment we are here to ensure this process is a simple and enjoyable as possible. If any questions arise about our services, feel free to Contact Us. We would love to hear from you!